National Disability Insurance Scheme goals in Australia. The Rex Bionics exoskeleton is a registered supplier with the NDIS in the Assistive Technology categories of Therapeutic supports, custom prosthetics and personal mobility equipment in all states and most territories. 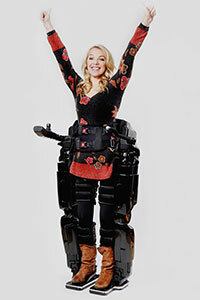 Rex Bionics Exoskeleton is now registered supplier under the Assistive Technology section of the NDIS. Allow participants to reach their goals and aspirations and live a more independent life. What is an Assistive Technology? If the goals you have set in your NDIS plan are to perform new tasks and activities or manage these more easily and safely, this is where REX can be useful. 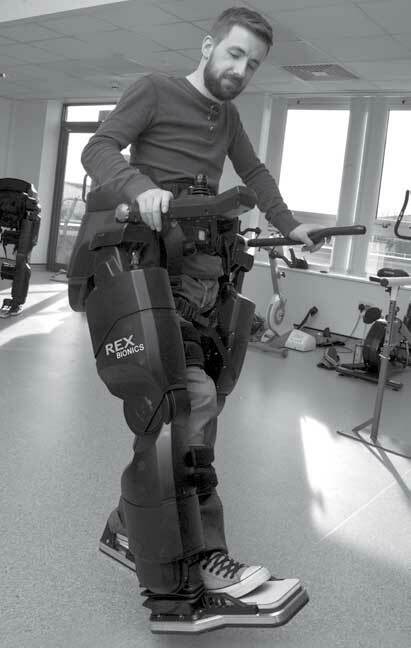 If performing new tasks and activities (or improving how you are doing now) requires you to develop more flexibility, strength, balance or endurance, REX is an exoskeleton platform where specific repeatable and accurate exercises (REXERCISES™) can be tailored by a physiotherapist to quickly address many of your needs. 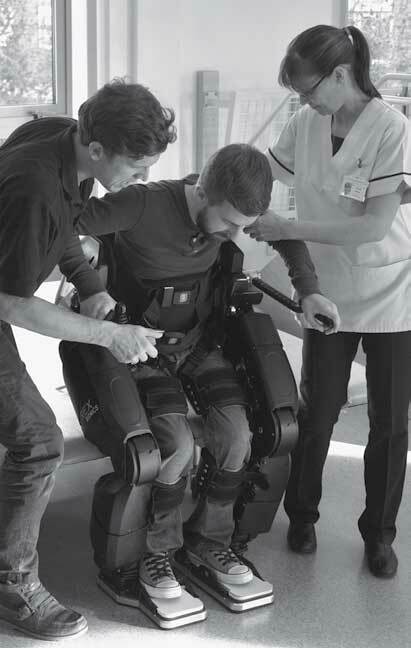 The REX exoskeleton provides a stable platform for you to perform exercises in not only an upright position, but walking backwards, sideways, in a lunge or squat position or whilst you are walking in the REX. Unlike any other exoskeleton available, REX does not require the use of poles or sticks to balance whilst you are walking or performing exercises. This allows your arms to be free to use the regular equipment found in a gym i.e. balls, weights, pulleys etc. Exercising in REX at home or at a gym gives you the chance to do upper and lower body exercises, stretches, as well as walking. By performing REXERCISE in an upright position, you can access a variety of muscle groups. REXERCISES are diﬀerent for each person – some REX users like a good workout, while for others being upright and walking provides all the movement they need. Rex Bionics has worked closely with rehabilitation experts to develop upper and lower limb functional exercises. REXERCISES™ mode is an advanced combination of static positions and dynamic patterns, that enable therapists to increase the dose, intensity and specificity of rehabilitation. REXERCISES gives therapists options to tailor programmes that fit your goals. Wheelchair users are at risk of developing numerous medical complications from extended periods of sitting. By spending more time, standing, walking and exercising, REX may oﬀer significant health benefits, including improved sleep, cardiovascular performance, maintenance of joint range, and a reduction in common abdominal problems including bladder and bowel problems and prescription drug use. A programme of worldwide clinical trials are now underway to evaluate these potential benefits. REX does not require the use of additional supports (e.g. crutches or poles), and is quick and easy for users to learn. REX can be used by people with complete spinal cord injury, as well as people who have suﬀered a stroke or other traumatic brain injury; and people with multiple sclerosis and other neurological conditions. REX for use in the home, enables users to undergo at home rehabilitation with their hands free providing for more exercise options. When standing in the REX, you are your full height as the REX is tailored to your specific measurements. Standing tall when socialising can have profound effects and in most indoor environments, REX can get you seeing eye to eye again with your friends and family. Both REX-P (personal use) and REX rehab are registered with the TGA – Medical device Class 1. Click the button below to see the listing in the TGA register. How can I access REX through my NDIS plan? Everyone’s situation is different and we look forward to helping you understand how REX exoskeleton can benefit you reach your goals through exercising upright and how to access the use of REX through your NDIS plan. Disclaimer: We will use your data to contact you for discussing REX and NDIS. Do you have any of the current conditions or injury? You have ticked "No" to all of the above, please contact us to discuss your individual situation. Is the intended User between approximately 4’8” and 6’4” in height(1.42 m to 1.93 m)? Does the intended User weigh between 40-100 kg (88 – 220 pounds)? You have ticked "No" to the above, please contact us to discuss your individual situation. Does the intended User have freedom of movement with or without assistance in the following joints? If you have ticked “no” or “unsure”, your physiotherapist can determine this. Can you transfer from your wheelchair to a chair unassisted? If you have ticked a "no" box in the previous question. Rex may not be suitable for you. Please contact us and we can put you in touch with a Physiotherapist who can further determine your suitability for REX. If you have ticked a "no" box in the previous question. Rex may not be suitable for you. Please contact us and we can put you in touch with a Physiotherapist who can further determine your suitability for REX. Do you have skin breakdown on legs i.e. rash, burn, ulcer, infection ? Are you at High risk of autonomic dysreflexia (sudden increase in blood pressure) in response to standing or walking? Any other contraindications to standing or walking? Any condition that would pose an unacceptable infection control risk? Spasticity of the lower leg extremities? If you have ticked a "yes" box in the previous question. Rex may not be suitable for you. Please contact us and we can put you in touch with a Qualified Healthcare Professional who can further determine your suitability for REX. Thank you for completing the REX quiz. According to your answers provided, you may be a candidate to use REX. To determine if REX could be a good option, have your own physiotherapist or exercise physiologist complete a thorough assessment. Yes, Please contact me to discuss how I can access a complete and thorough assessment. Yes, I have additional questions about REX.